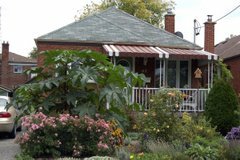 Gardening in Toronto: Plant Sale in West Toronto May 16th! Plant Sale in West Toronto May 16th! Looking for some new (to you) and interesting perennials? Or a few annuals to brighten your 2009 garden? Roselands Horticultural Society, the group I belong to, will be hosting our annual plant sale on Saturday, May 16th, 2009 from 9 am to noon. We will be located in the Northwest quadrant of Eglinton Flats park (take Emmett Avenue north off Eglinton, just west of Jane). This is the Mount Dennis area of Toronto. Evergreen will also be there, doing the season kick-off for the Emmett Avenue Community Garden, and the Mount Dennis Community Kitchen will have breakfast available for purchase.